Virtual Reality: Digital Treatment for Real Pain - Augmented Reality, Virtual Reality & Mixed Reality services in Chennai, India. Now Amanda Greene is trying something different. It is called “virtual reality” therapy. Virtual reality, or VR, is growing in popularity in video gaming and some training programs. The person wears special equipment that covers the eyes. Inside, he or she sees images and hears sounds coming from a computer program. The experience makes people feel as if they are in the picture they are watching. For Greene, the virtual experience helped her feel more at ease and trained her to breathe in a special way. She saw a tree, crystals, and her breath as she was guided to breathe in and out. 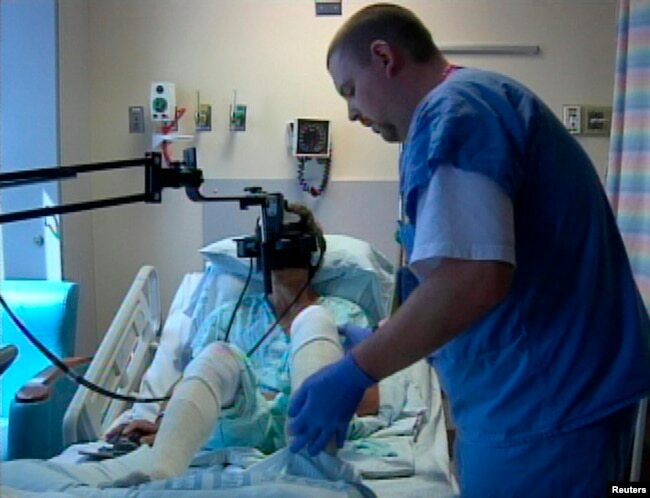 FILE – A hospital patient uses virtual reality treatment for pain in this undated photo. Brennan Spiegel is a doctor who treats patients with stomach pain and intestinal problems. He says these disorders are sometimes connected to a person’s mental health. VR can help, he explains, by changing the messages in the brain and nervous system. Spiegel is the director of Health Services Research at Cedars-Sinai Hospital in Los Angeles, California. He heads Cedars-Sinai’s virtual reality program, where more than 2,500 patients have been treated. Opioid abuse has led to many deaths across the United States. But, unlike opioids, Spiegel does not think patients seeking pain relief would become physically dependent on VR therapy. Researchers are looking at possible side effects. For some patients, less than 10 per cent, they may feel off-balance and sick to their stomach when wearing the VR headset. 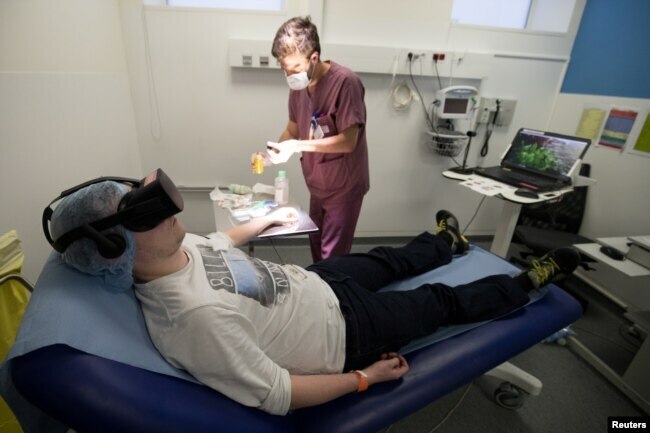 A nurse treats a patient wearing the 3-D therapeutic virtual reality headset developed by the Healthy Mind startup, at the emergency services department of the Saint-Joseph Hospital in Paris, June 7, 2018. 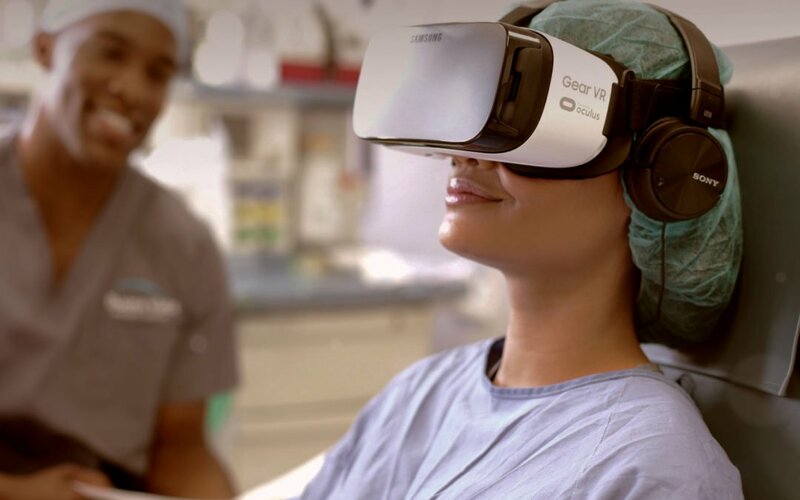 Spiegel said more than 100 hospitals nationwide are using VR to help patients control pain and nervousness. He added that more countries are taking an interest in VR, and doctors are beginning to develop policies on how to use the technology in health care. Swamy Venuturupalli is a doctor and the founder of Attune Health, a centre treating patients with autoimmune diseases. He is studying how visual technology can reduce the pain his patients feel. VR experiences may include swimming with dolphins and meditation exercises in front of a campfire. Venuturupalli says VR does more than just distract patients who are in pain. It can train them to learn deep breathing exercises. And it can help them with biofeedback, the ability to control things like heartbeat and brain waves with your mind. A business called AppliedVR is testing virtual reality to see how it may help people deal with their pain. Its president, Josh Sackman, says his company is developing programs that will be helpful to patients of different ages, personalities and interests. He says the goal is to create a VR pharmacy to serve them all. Sackman told VOA he has seen an improvement in the medical world’s understanding of VR over the past three years. And, he says, with patients using VR, you see a physical change in a short time as they go from someone “in terrible pain, stressed,” to relax. Brennan Spiegel says the aim is not to have the patients stay in their virtual world forever. The idea, he says, is for people to learn in VR that they can control their body and that the mind matters. And then, people can use those skills when they need it, in the real world.